QUESTION: Mr. Armstrong; I found your recent article on inflation and contagions fascinating. Am I correct in summing it up that today because currencies are not commodity based, they rise and fall on anticipation of political events whereas under precious metals contagions took place by one country debasing compared to another? ANSWER: Correct. The monetary system has been altered far more than people understand. The question of money supply and inflation was philosophically established with Gresham’s Law. 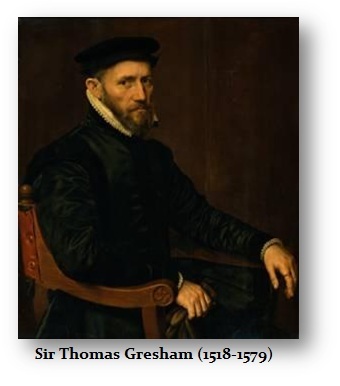 Gresham worked in Amsterdam and witnessed the response to the debasement of Henry VIII in England. His proposition that bad money drove out good money from circulation was one important observation. As countries would debase, people would hoard the old coinage, and actually, the money supply would shrink. It then requires a greater production of debased coinage to maintain an adequate money supply. This results in more debasement and unfolds in what people call hyperinflation. Yet, it is much more than simply just producing debased coinage or in modern time printing more money. In addition to this observation, what is overlooked is frankly the driving forces behind the foreign exchange markets during the precious metal based monetary system and the modern paper monetary system (soon to be electronic based monetary system). Under a precious metal system, the coinage of one nation is compared and exchanged with others based entirely on its monetary value based on metal content. If England was at war with France, this had zero impact upon the value of their coinage as long as there was no debasement. Once debasement began, then the exchange rate between one currency and another changed. Consequently, this influence of anticipating future value based upon possible political decisions was not readily dominant and the coins of one nation were compared entirely on their metal content rather than political events. 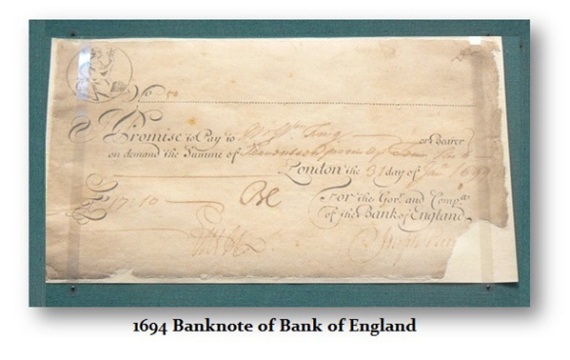 When money began to appear as paper currency, this altered the monetary system for then the value of that currency was dependent upon the “confidence” of the people in that currency. Bank runs would emerge when people lost confidence in that establishment surviving. 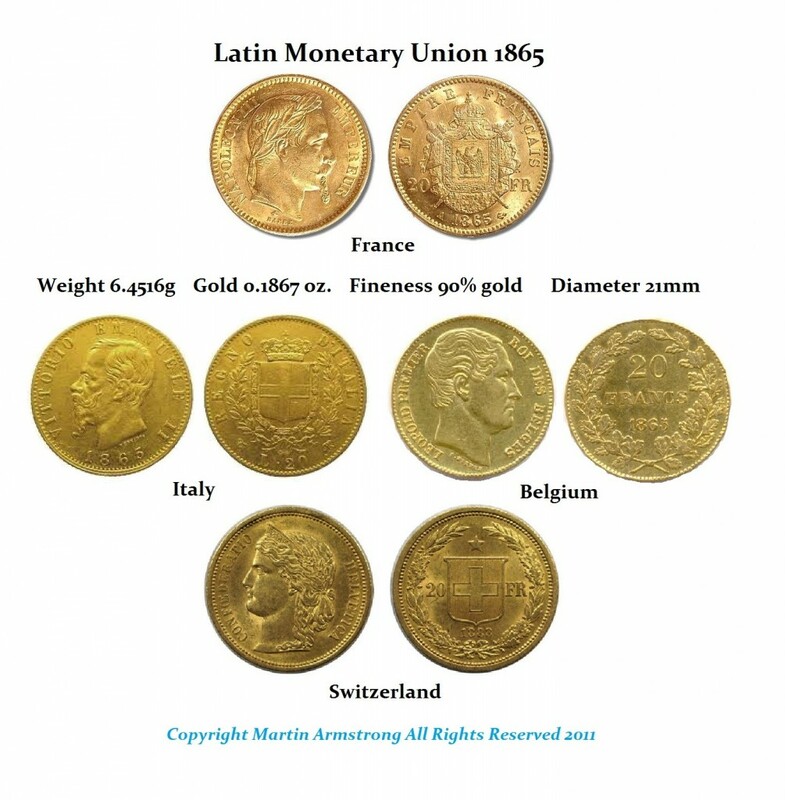 The Latin Monetary Union was an attempt to create a gold standard whereby member nations issued a standard coin of equal weight and metal content as to allow them to be interchangeable. Therefore, 20 French francs was equal to 20 Italian lire, 20 Belgian francs or 20 Swiss francs. The problem with commodity based monetary systems has always been that domestic economic trends in one country are exported as contagion to others. For example, the Spanish discovery of South America led to a massive influx of gold and silver coins which then created a contagion of inflation (lowering the purchasing value of coinage) throughout Europe. The waves of gold discoveries during the 19th century also created huge instabilities in the business cycle resulting also in waves of inflation. This is what Kondratieff studied to come up with his long wave theory. War has always resulted in waves of inflation as governments have had to increase the money supply to pay for these expenses. The US national debt exploded by $1 trillion for the Iraq war. We find from the very beginning of coinage in Lydia, its war against Cyrus the Great of Persia also resulted in a debasement of the very first coinage. There are clearly established driving forces behind the monetary systems rise and fall. What we must come to understand is that a commodity based monetary system NEVER produced a perfect world where money was tangible and worth something. There were always waves of inflation based upon the discovery of new metal deposits. If we had a money supply that could NEVER change, then you would create deflation as the population grew. If there were only 10 gold coins and a population of 5 people, then everyone could have two coins, but one will inevitably have 4 because they invented something others wanted. Increase the population to 10, then the value of the 10 coins will rise in value meaning asset values will decline creating deflation. Therefore, a tangible monetary system has never eliminated the business cycle and it will never bring “stability” as people preach. What has taken place is that by moving to a paper monetary system and a unit of account, which is increasingly more electronic (since paper money is less than 5% of commerce), the “confidence” factor that was once predicated upon the metal content has migrated to political events and thus we anticipate the future possibilities in the current value of any currency. Here is a chart of Bitcoin. Once again, we do not see an instrument which is immune to the business cycle. It does not matter if we are dealing with coins, paper money, or electronic entries. Everything will still be subject to the business cycle. There will NEVER be any such exception. Moving forward, the only way to isolate contagions to some degree will be to create a basket of currencies as the international unit of account. It will still rise and fall in value. It cannot be permanently fixed. Therefore, while our computer forecasts that China will emerge as the Financial Capital of the World after 2032, those who hate the dollar and keep calling for its demise fail to understand that the more critical element that will make the China yuan a major global currency is when the “confidence” level rises among big capital and they feel “comfortable” parking their money in Chinese bonds, assets, etc. China is moving in that direction slowly. They will eventually allow their currency to be freely traded and currency controls will vanish. As that dawns, then we will see the yuan rise in global respect. They are moving to achieve that position. It just takes time. We MUST comprehend that contagions have existed in ancient times to modern times regardless of the monetary system be it precious metals, paper, or electronic. We are all connected and the sooner we come to grips with that understanding, the sooner we can move forward in our evolution of money. Even the creation of money by banks through lending is driven by the business cycle.